Ignite one burner on gas grill; heat to approximately 350°F, or medium heat. In a 12-inch cast iron skillet, combine brown sugar, cinnamon, heavy cream and butter. Place skillet on grill over ignited burner. Use a wooden spoon to stir ingredients in skillet 2 to 3 minutes until well combined and lightly caramelized. Remove from heat. Carefully place sliced peaches in skillet on top of sugar-butter mixture. Meanwhile, prepare cake mix batter according to package directions. Pour batter evenly over peaches in skillet. Return skillet to grill over indirect heat (away from ignited burner). Cover grill and bake cake 45 to 50 minutes at 350°F, rotating skillet halfway through baking, until a toothpick inserted in the center comes out clean. Cool cake 10 minutes in pan. Run a knife along edge of skillet to loosen cake. Place an inverted serving plate over top of skillet; carefully and quickly flip skillet over. Remove skillet. Serve cake warm or at room temperature. Cake is best served fresh from the grill the day it is made. Serve warm cake slices with fresh whipped cream or vanilla ice cream. A perfect summertime dessert: Easy and with no oven required. DUDES. And dudettes. Did you know that you can bake a cake on a grill? Well, YOU CAN. 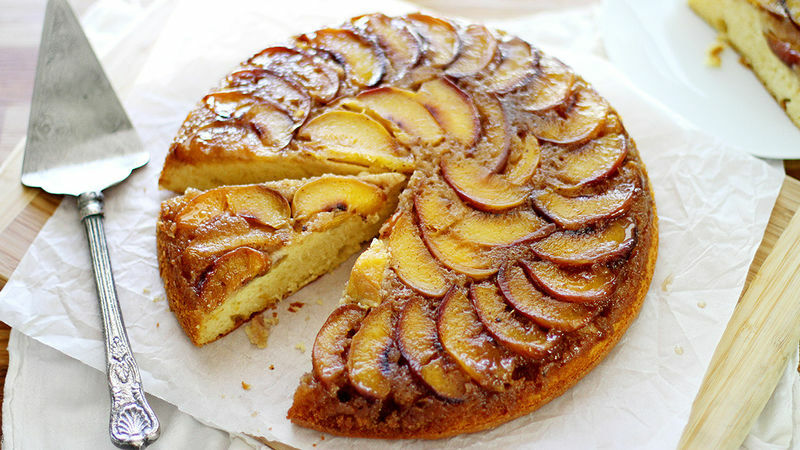 And this upside down skillet peach cake is the perfect recipe for the job. Once you bake a cake grill-style, you may never want to turn your oven on again. I’ll admit I was surprised this cake even happened. I mean, I can barely grill hot dogs without burning them to charred oblivion, so I didn’t have high hopes that this cake would work. Turns out I was very wrong. It’s so easy to prepare, and once you put all the ingredients together, you just walk away, enjoy the sunshine, and voila! The cake is done. Serve it warm with whipped cream or vanilla ice cream for a cookout dessert and you’ll be hooked on cake grilling for life. First, prepare your ingredients. It’s best to make sure every ingredient in the recipe is measured and/or sliced ahead of time so you can work more quickly and efficiently—and spend less time in front of the hot grill. In a large skillet over direct medium heat on a gas grill, combine some brown sugar, heavy cream, cinnamon and butter until it’s all well combined, bubbly and beginning to caramelize. This, along with fresh sliced peaches, will be the topping for the cake and you’re going to love it with a capital L.O.V.E. Place the sliced peaches in a circular pattern on top of the brown sugar-butter mixture. Meanwhile, prepare the cake batter. I love how easily and deliciously Betty Crocker™ yellow cake mix pairs with the topping for this recipe, and bonus—it bakes up perfectly on the grill. Who knew? Oh, that Betty. Pour the cake batter over the peaches in the skillet, then return the skillet to the grill over indirect medium heat. Cover the grill and bake the cake 45 to 50 minutes, rotating skillet halfway through baking, until a toothpick inserted in the center comes out clean. Let the cake cool 10 minutes in the skillet, then carefully invert the cake onto a serving plate. The best part about this cake: You can serve it right away while it’s warm, but it also tastes great at room temperature. Cake + grill = mission accomplished.